When Tennessee’s newest federal judge, Mark Norris, took the public oath of office to sit as a trial judge in the United States District Court for the Western District of Tennessee, his state judicial colleagues were there to show their support. Before taking the bench, Judge Norris served in the Tennessee State Senate from 2000 – 2018, serving as Majority Leader for 11 years. Also speaking at the event were U.S. Senator Lamar Alexander, U.S. Representative David Kustoff, and Governor Bill Haslam, among others. Tennessee Bar Association President Jason Pannu presented Judge Norris with a gavel. In addition to Justice Kirby, also representing the Tennessee state judiciary were Chief Justice Jeff Bivins, Justice Cornelia A. Clark, Judge Brandon Gibson, Judge Ross Dyer, Judge Arnold Goldin, Judge Valerie Smith, Judge Mary Wagner, Judge Dan Michaels, and Administrative Office of the Courts Director Deborah Taylor Tate, among others. Prior to entering public service, Judge Norris practiced law at Armstrong Allen in Memphis. He was also senior counsel at Adams and Reese in Memphis and served on the Shelby County Commission. President Donald Trump nominated Judge Norris for the bench in July 2017, and he was confirmed by the U.S. Senate in October 2018. 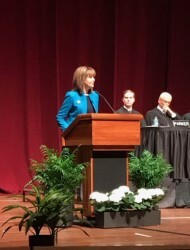 Justice Kirby speaks at the investiture of federal Judge Mark Norris.